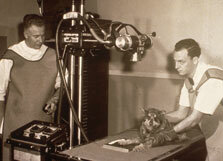 Veterinary medicine at the University of Missouri began in 1884. It progressed through five stages: a course in veterinary science, a department of veterinary science, a school of veterinary medicine in the division of agricultural sciences, a school of veterinary medicine as a separate division and, finally, a College of Veterinary Medicine. In 1885 the first vaccine-virus laboratory in the United States was established at the veterinary science department. A veterinary laboratory was erected in 1887. In early years, staff veterinarians taught courses to medical and agricultural students, conducted research on tick fever and investigated livestock disease throughout the state. 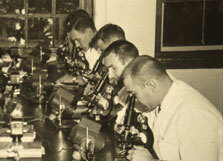 In the 1950’s, veterinary medical students relied on the microscope as their primary diagnostic tool. The college’s first building, Connaway Hall, was built in 1910-11 to house veterinary science faculty who taught courses to agricultural students, investigated animal and poultry diseases, performed diagnostic and extension work and produced animal vaccines. The professional curriculum leading to the DVM degree was established in 1946 to offer educational opportunities to World War II veterans. In 1950 26 new veterinarians graduated in the first class. In 1952 the school graduated its first female veterinarian. From 1946 to 1965 there were 30 students, all Missouri residents, in each of the four classes studying for the DVM degree. In 1965, class size doubled, and non-residents were admitted in response to federal funding incentives. These federal “capitation” funds offered to alleviate a national shortage of veterinarians stimulated another class size increase (to 76 students) in 1976. In the early 1980s, the national need for veterinarians stabilized, federal funding was withdrawn and enrollment was lowered in the interest of quality education and efficient space planning. As the demand for veterinarians again increased, the college admitted 68 students in 2004, 76 in 2005, 80 in 2008 and 120 each year since 2010. The college has graduated more than 4,000 veterinarians since 1946. A teaching hospital was built in 1961, and a diagnostic laboratory and a teaching and research building were added in 1977. Clydesdale Hall, a 149,000-square-foot medical teaching hospital, was completed and occupied in March 1993 (and was remodeled in 2000 to remain at the forefront of clinical education). At the time known as the Veterinary Medical Teaching Hospital, it was renamed in 2015 and became the Veterinary Health Center, comprising the Equine, Food Animal and Small Animal hospitals. A multi-million-dollar renovation to the Veterinary Medicine Building and Connaway Hall were completed in 1997 and 1998, respectively. Since 2000 and 2001 the College of Veterinary Medicine, along with the National Institutes of Health, has supported the MU Mutant Mouse Resource and Research Center, and the Rat Resource and Research Center, respectively. In 2008 the Research Animal Diagnostic Laboratory opened its new $15.5 million facility at Discovery Ridge along U.S. Highway 63 south of Columbia. The college sold the lab to IDEXX Laboratories in 2011. Also in 2008 the Laboratory for Infectious Disease Research was dedicated on the MU campus. One of 14 such facilities in the country, the state-of-the-art laboratory gives researchers the necessary tools to study emerging infectious diseases such as West Nile virus and tularemia, pathogens commonly found in Missouri, and to assist in national, state and local public-health efforts in the event of a bioterrorist or infectious disease emergency. The college expanded its veterinary care to the St. Louis area in 2011 with the opening of the Veterinary Health Center — Wentzville. The satellite clinic provides convenient care for area clients whose pets need cancer treatment, behavior treatment, dermatology or advanced diagnostic imaging. A Large Animal Ambulatory facility comprising 7,200 gross square feet opened adjacent to Clydesdale Hall in 2017. The lower level of new building provides garage bays for the Veterinary Health Center’s ambulatory vehicles: fully stocked trucks that go out to farms to diagnose and treat the medical and surgical needs of animals. Space for offices and a classroom are on the building’s upper level. Funds for the approximately $2.9 million facility were allocated by the Missouri Senate and House Agriculture Committee to expand MU’s large animal veterinary medicine program. In February 2018 the first female dean of the college was appointed.